We have our preferences. What are yours? We know what the new 2020 Toyota Supra looks like in red, white, and matte gray, but what about the five other colors that’ll be offered? Toyota has just revealed the entire eight-color palette options for its reborn sports car and now you can decide for yourself which one looks best. The choices are as follows: Absolute Zero White, Nocturnal Black, Renaissance Red 2.0, Phantom Matte Gray, Tungsten Silver, Turbulent Gray, Nitro Yellow, and Downshift Blue. Of the eight, only two carry an additional cost; Phantom Matte Gray will set you back $1,200 while the Nitro Yellow is a more reasonable $400. Launch Edition trims can be had in Nocturnal Black, Nitro Yellow and Renaissance Red only. These Launch Edition cars, priced from $55,250, all come with red mirror caps, black 19-inch wheels, and commemorative plaques. The Black and White Launch Editions also feature a red leather interior. If you can’t swing the $55k or you simply don’t care about having a Launch Edition, the Supra 3.0 has a base price of $49,900 while the 3.0 Premium begins at $53,990. Regardless of trim, all US-spec Supras are powered by a new twin-scroll turbocharged 3.0-liter inline-six making 335 hp and 365 lb-ft of torque. Power is directed to the rear wheels through an eight-speed automatic gearbox. And no, Toyota does not have any immediate plans to offer a manual. There is, however, a possibility a targa top variant is planned for a later date. 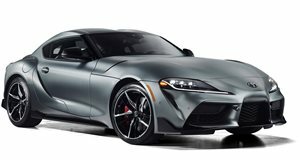 With its 50:50 weight distribution and total curb weight of 3,397 pounds, the Supra will sprint from 0 to 60 mph in 4.1 seconds and maxes out at 155 mph. It also comes standard with an active differential, Brembo front brakes, and Michelin Pilot Super Sport rubber. There’s no question the new Supra is a true sports car, no matter where you stand on its design inside and out. And for the record, we’re partial to Nitro Yellow and Phantom Matte Gray, despite the extra cost.